Intimate weddings do not miss out on the fun factor that traditional weddings entail. 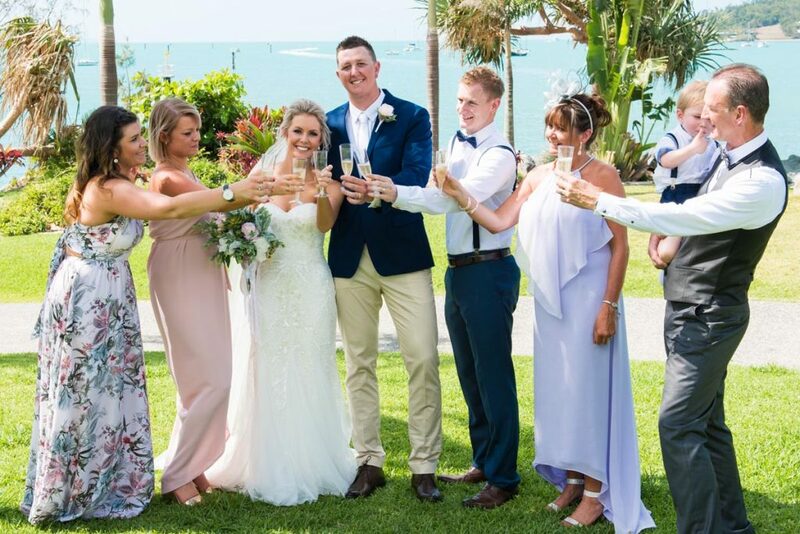 If you are the one who loves the frenzy of fireworks, a once in a lifetime sailing experience, or a gourmet long lunch overlooking the Coral Sea, but in all the company of your closest circle, then an intimate wedding celebration is just perfect for you! Picture this… After a big day preparing and primping with your bridal party you finally make it to your ceremony venue, step out of your car, hustle your way to the start of the ceremony aisle and without a moment to take it all in your are rushed towards the altar, your eyes gloss over the hundred and one guests that stare at you from their rows of chairs and … wait, wait, wait. This can’t be right, this can’t be your wedding day, you didn’t arrange for this feeling of disconnection in your wedding planning diary! Whilst you may have been led to believe that the traditional ostentatious wedding affair is the only way to go, there is another option for you. An option that will make your celebration far more enticing to you and your guests and will ensure you only stay surrounded by people who mean the most to you. Now let’s get this straight, we are not talking about converting you to the extreme end of the scale that is the classic elopement. They certainly have their place in the wedding market, but instead we are talking about intimate weddings; boutique celebrations that range from 10 to 40 guests and give you the power, and the budget, to plan a wedding day celebration unique to you. Nowhere in Australia does intimate weddings like the Whitsundays. It is the ideal locale to host your destination wedding with a range of boutique venues and luxury add-ons at the ready for you to peruse and choose from. 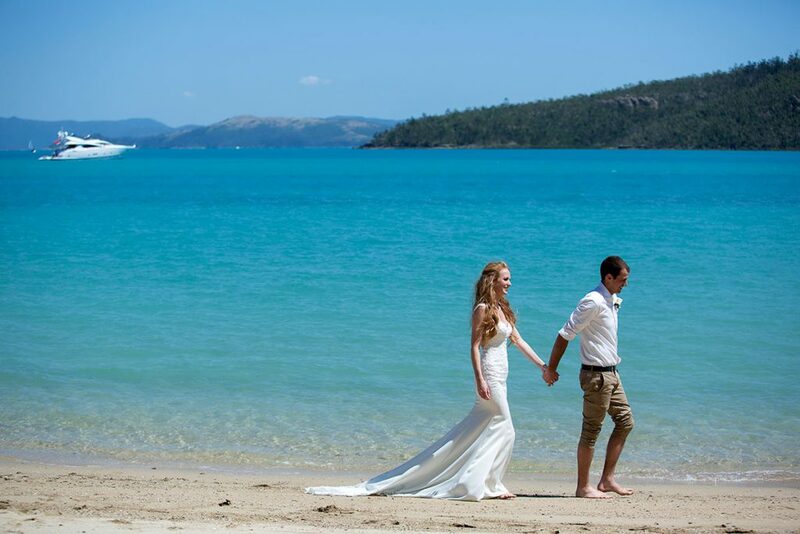 Nowhere in Australia does intimate weddings like the Whitsundays. So let’s be straightforward. The less people you invite the less you spend per head on invites, bonbonniere, food and beverage and every other element you factor into your day, so of course these is huge potential to save money when you cut your guests numbers in half. But saving money is surprisingly not the main reason that brides are opting for intimate weddings, but instead making their budget go further. Organising a small wedding does not mean that it has to be devoid of any luxury. In fact, when you have fewer close friends and relatives to cater to, you can opt for a more lavish venue and spend a bit more on the areas you truly wish to splurge on. The Whitsundays is home to the luxury extras and below are just a handful of the options you can choose from. Host your reception at a luxury holiday home and experience the day like Hollywood royalty. 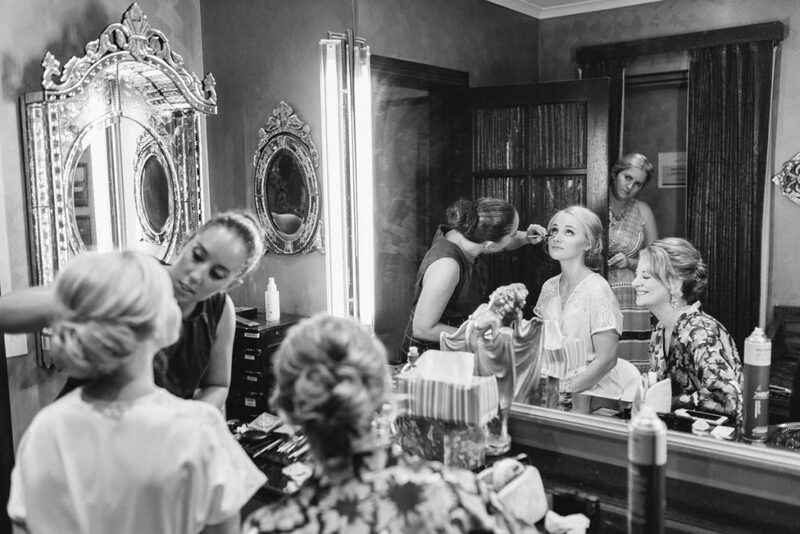 Or book the penthouse at Pinnacles Resort and Spa and invite your closest girlfriends over for a day of pampering preparations and of course the ultimate wedding night experience. 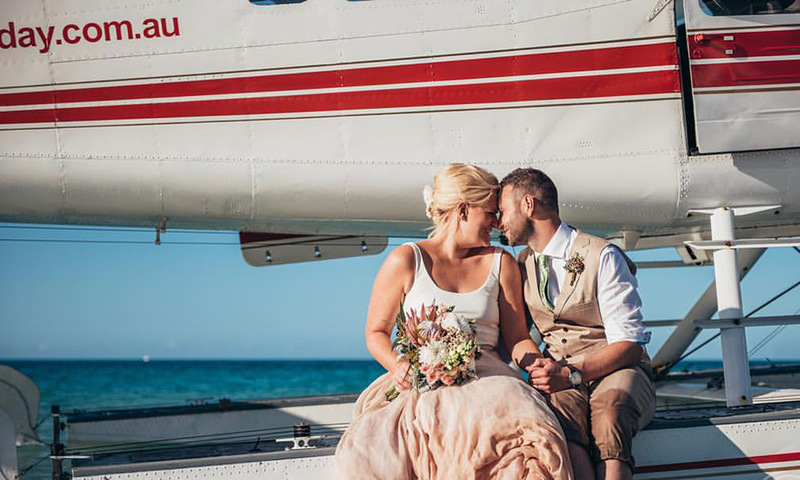 Arrive to your wedding ceremony in style via private helicopter or seaplane with Air Whitsunday. For something truly exclusive charter a private vessel. Sail to a deserted beach for your wedding ceremony or treat your guests to a sunset cruise post ceremony for cocktails and canapés. Intimate weddings provide you the opportunity to share some meaningful moments with your partner, and exchange in personal conversations with those whose presence you truly cherish. 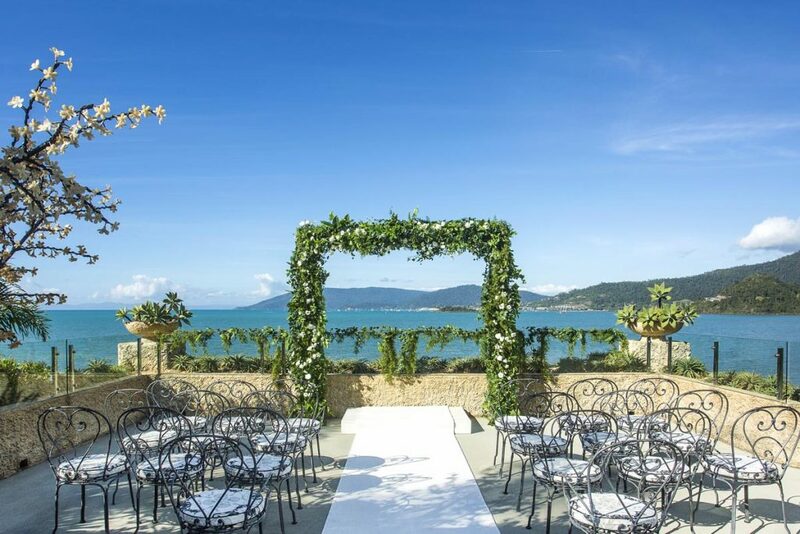 Most Whitsunday wedding venues are equipped to host smaller wedding numbers and here are a few of our top picks. The Whitsunday Pavillion situated on a private pocket of land in the heart of Airlie Beach offers a unique reception experience where you and your guests can dine right by the sea under the tropical night sky. 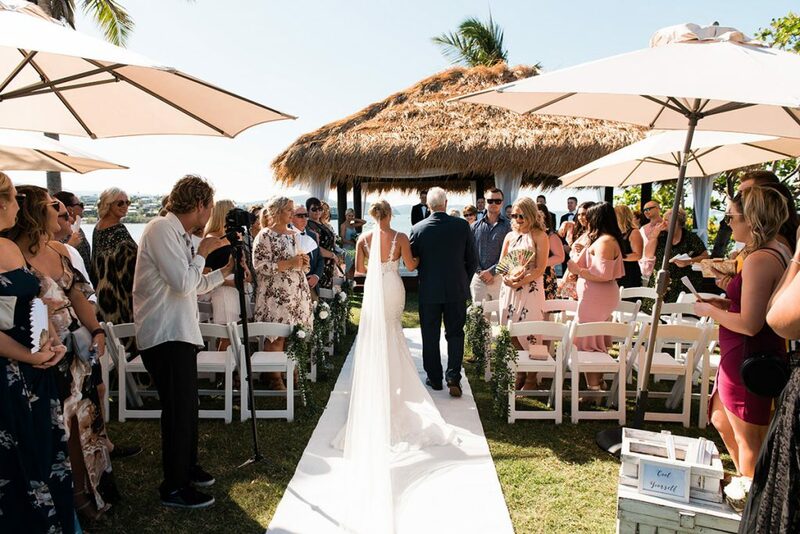 The Coral Sea Resort Jetty and Oceanfront Lawn are two seaside reception venues that offer a more personalised setting when you have groups under 40. Allowing more space to mingle with your guests. By reducing guest numbers Villa Botanica’s private estate becomes much more economical and enjoyable. 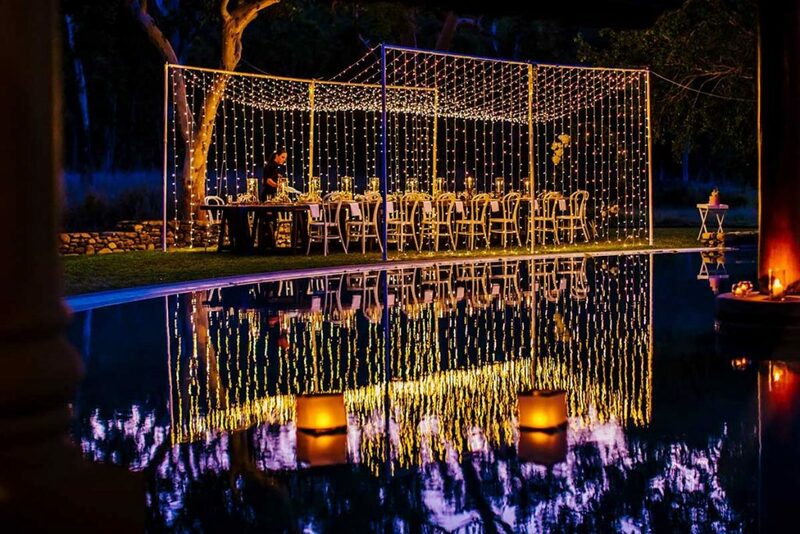 Having sole use of the venue with a small group of family and friends imparts the feeling that you are hosting your most loved ones at your very own luxury estate. 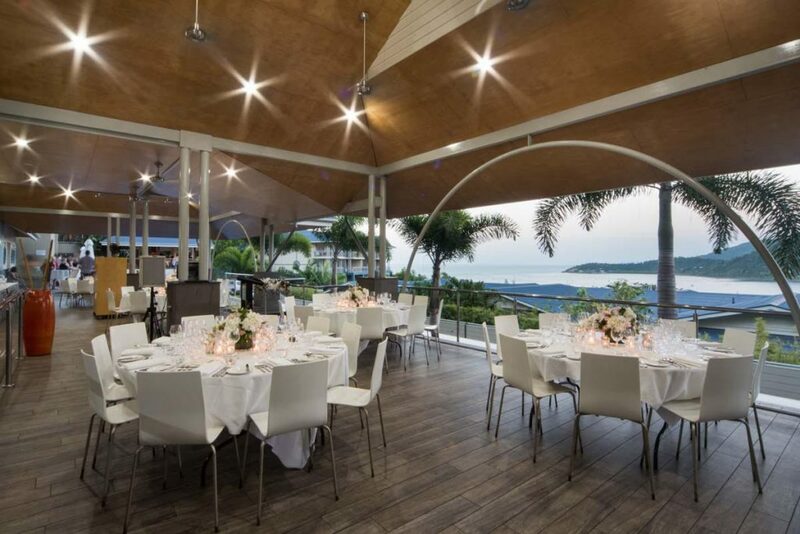 Peppers Airlie Beach provides their open air pavilion for sit down receptions of 30 guests and under, the perfect spot to enjoy a quite dining experience from one of the regions finest restaurants. Customising a wedding to accommodate a large gathering is difficult and expensive. An intimate wedding is not only easy on your pocket, but also more manageable in terms of the preparations. So, with an intimate celebration, you can truly let your creative juices flow, and add personal touches to your wedding, just the way you want. Here are a few of our top picks. Let’s face it, less guests’ means less guests to stress about. You can plan for your dream destination wedding with more ease and now you have the funds to invest in a dedicated wedding planner who can take care of as much or as little as the affair as you choose. 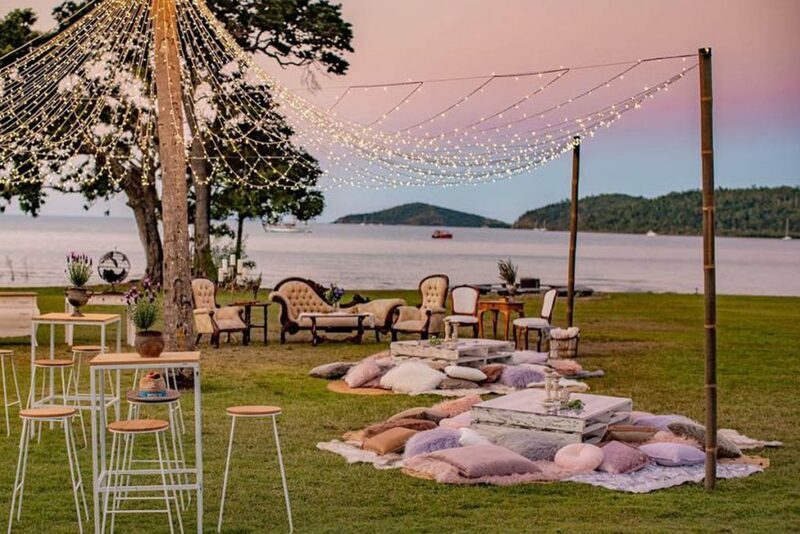 The Whitsundays have a number of specialised wedding coordinators who are all experienced in planning unique, boutique events. Treat yourself to a dedicated wedding planners and you don’t have to worry about a single thing.. seriously, not a single thing. Why celebrate your love on just one day when you can extend the celebrations over a number of days, enjoying pre and post wedding activities will create lifelong memories for you and your guests and will ensure that you spend quality time with each and every one of the people you invite to your wedding. The Whitsundays is well equipped for the wedding week with a large variety of accommodation options for your guests to choose from, a generous selection of restaurants and cafes to enjoy a pre wedding day dinner or post wedding day brunch and a host of planes and boats to help you explore the Whitsunday Coast. And of course with less guests to accommodate the wedding week is now so much more practical to plan.